Handstands may seem overrated to some, but they actually offer a wealth of benefits that make your upside down efforts all worth it. Aside from boosting your bodies balance, handstands also strengthen your upper body, tone your abdomen, and increase your circulation. It can even boost your mood, all thanks to its calming effects! It can be frustrating to do the handstand, especially when you're just starting out, but there are ways to easily get yourself upside down and into a strong handstand. Here are four techniques that will help. If there’s one thing you should first rely on when doing the handstand, it’s the wall. It’s the easiest and most convenient support you can get especially on your first tries. To practice with the wall, first, you need to position your hands around 10 to 12 inches away from the wall, then kick your legs up. Let your feet rest on the wall first so you can stabilize your body. Press the floor away from your body to boost your arms and shoulders, while engaging your core. You may also try bending either of your knee while positioning the same side of your foot flat on the wall. The other leg should be kept straight. Adjust according to how much of your weight you can handle. Make sure to keep your body straight as you may put your back, especially your spine, at risk. The L-shape is a variation for the wall support. The wall here, however, will not be there to catch you since you are going to face it. To do the L-shaped, first sit on a block as you face the wall, making sure that your legs are extended so that your feet are positioned flat on the wall. Move the block next to your hips to mark the distance from your hips to the wall. Next, do the downward dog. Your hands should be near your block, while your feet should be positioned on the wall. Walk your feet up the wall very carefully up to the point where your hips are located over your shoulder. Make sure your core is engaged. The knee-to-chest technique is often where you will able to fully experience control and balance among the handstand techniques. It’s also believed to be the most comforting as it’s relatively easy to do. To do this technique, you must first relax yourself while doing the Downward Facing Dog. Next, step your right foot forward, keeping your right knee closer to our chest. While keeping your knee on your chest, position your shoulders forward to stack above your wrists, then slowly lift your left leg while pressing the right foot away from the floor. Practice a few hops while holding this position. Repeat the same procedure on the other leg. The L-shape is a game changer because instead of keeping your legs close to your body, you are going to extend your legs so that your core muscles will be engaged in a new level of intensity. To do the L-shape, again, do Downward Dog, then take a few deep breaths. Start with doing the same hops in the knee-to-chest techniques, then carefully straighten and extend your legs. Once you feel your core boosted, you will also feel your stability and balance changing, which is a sign that you are on the right track. Once you master this technique, you will get used to the feeling of being upside down. Finally, kick up, making an L-shaped handstand. 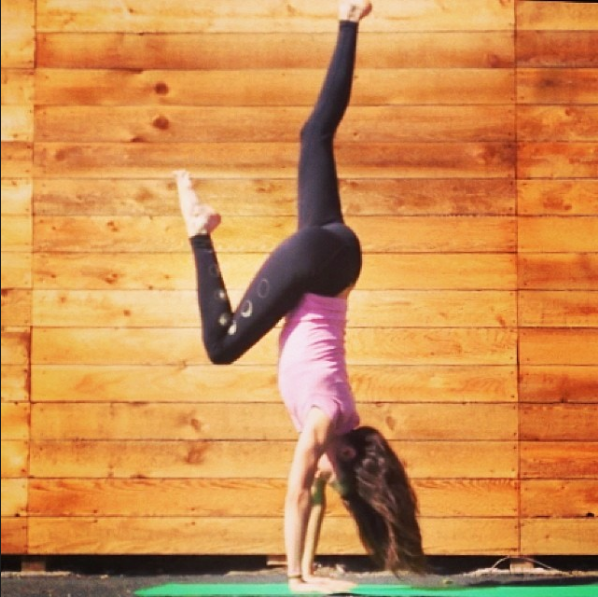 Handstands are a great way to keep your yoga practice exciting and fresh. Make sure, though, that you put your safety first before anything else. Remember to do warm-up exercises before doing the handstand so you won’t strain your body.